Dedicated to meeting the needs of economically disadvantaged and underserved communities. UB Community Development (UBCD) is dedicated to meeting the needs of economically disadvantaged and underserved communities. UBCD, a community development partner of United Bank, was recently certified by the U.S. Department of Treasury as a Community Development Entity (CDE). This distinction was earned, in part, because of United Bank’s demonstrated community involvement, including execution of programs related to financial literacy, homebuyer initiatives and credit building programs. Founded in 1904, United Bank, has a history of providing exceptional customer service and innovative technology to our customers, which has endured the test of time and is at the heart of our continued expansion into new markets. In 2016, United Bancorporation of Alabama, Inc, the holding company for United Bank, received $65MM in New Market Tax Credits, and remains the only community development entity headquartered in Alabama to receive the allocation. In 2017, following the successful deployment of more than $90MM of New Market Tax Credits, UB Community Development received a $55MM allocation of New Market Tax Credits. This allocation further validates our team’s extensive expertise and passion to bring community oriented economic development projects to qualifying areas. UBCD’s New Market Tax Credit program is part of a federal tax credit program enacted by Congress in 2000, designed to stimulate private investment in low-income urban neighborhoods and rural communities. UBCD’s New Market Tax Credit program and the Community Facilities Lending Programs provide funding options for eligible projects located in qualifying census tracts. The qualifying census tracts consist of locations where the individual poverty rate is at least 20 percent or where median family income does not exceed 80 percent of the area median. Simply put, the new market tax credit allocation allows UBCD to raise capital from private investors in exchange for the rights to claim the tax credits over a 7-year period. The capital raised by investors in exchange for the tax credits is used to provide low-interest loans to qualified businesses in low-income communities. UBCD is currently using the tax credit program and Community Facilities Lending Program allocation to fund small businesses and finance projects related to education, healthcare, manufacturing, hospitality, non-profits and community centers. The projects funded through UBCD’s new market tax credits and Community Facilities Lending Programs will create jobs in low-income communities, provide goods, services and housing options and ultimately improve access to quality healthcare and affordable food options in low-income areas. 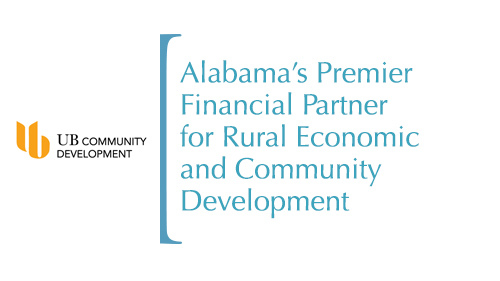 Our past performance as an experienced leverage lender in NMTC transactions coupled with our passion for improving the communities around us, make UBCD Alabama’s premier financial partner for rural economic and community development.